First of all Let's Start With Some Good News. The Maersk Alabama has safely reached Mombasa, Kenya with its Supplies of Food and Cooking Oil that is intended to Assist People who are Starving. The Bad News is that the Standoff regarding Captain Phillips Continues at this time. There will soon be a Third US Naval Vessel on the scene within the next few hours. Within the Next Few Hours the USS Boxer which happens to be the Flagship for TF-151 (Mulinational Task Force to Combat Piracy in the Gulf of Aden) is expected to Augment the USS Bainbridge and the USS Haliburton at the location where the lifeboat where Captain Phillips is being held on is located. An attempt by the Somali Pirates to reenforce their Colleagues holding Captain Phillips hostage was thwarted after receiving Vocal Warnings From the US Navy. The Standoff has lasted more than 72 hours now and it is believed that there is roughly Another 7 Days of food and water left on board the lifeboat. The USS Boxer seen here is presently on the way to the scene of the Standoff involving Captain Phillips. What Options are now available to the United States in this Crisis? Should we pay the $2 Million Ransom and Grant Safe Passage back to the Mainland which is what the Pirates are demanding? So Far this year there have been 66 attacks in the Gulf of Aden Region. With the attack on the Italian Vessel today the number of ships currently that are being held by Pirates stands at 13. This puts the number of Hostages being held against their will to be at least 200 People! So why should Bad Behavior be rewarded? The Arrival of US Naval Assets particularly the Boxer will greatly increase US Options to resolve the Situation. Although the FBI is negotiating with the Pirates for a Peaceful Resolution of this crisis. 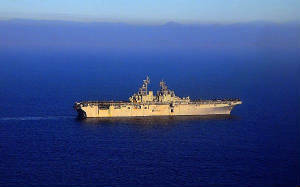 The USS Boxer carries Assault Helicopters and has a Battalion of Marines onboard. It also is capable of being used as a Platform in case the SEALS wish to conduct a rescue operation. The Pirates have stated that if the US launches a Military Operation they will Kill Captain Phillips. He has already tried to escape once already so is this a Hollow Threat made by desperate people? An Excellent Article to read is the Column on the New York Post by Ralph Peters. The Title says it all "Hang em High".